Got some days off work and you’re thinking of a fun city to visit? Or you’re going on a business trip to London and you’re looking for fun things to fit into your itinerary? Then you should definitely visit some Must-See Tourist Attractions in London. London boasts of several historical landmarks and many great London tourist attractions to keep you busy, you will never run out of amazing things to do. These are some Must-See Tourist Attractions in London. In 1761, King George III acquired it as a private residence for Queen Charlotte and became known as The Queen’s House. If you are visiting London for the very first time, the Queen’s House is a must see. Buckingham Palace is also the scene of London’s most popular display of pomp and circumstance, the Changing of the Guard. This colorful and free display of precision marching and music draws crowds at 11:30am in every season. It takes place at St. James’s Palace where you can follow the band as they march between sites. From prison to palace, treasure vault to a private zoo, the magnificent Tower of London has served many different purposes. This spectacular World Heritage Site is one of Britain’s most iconic structures. It offers hours of fascination for visitors curious about the country’s rich history – after all, so much of it happened here. Inside the massive White Tower, built in 1078 by William the Conqueror, is the 17th-century Line of Kings with its remarkable displays of royal armaments and armor. Other highlights include the famous Crown Jewels exhibition, the Beefeaters, the Royal Mint, and gruesome exhibits about the executions that took place on the grounds. The adjacent Tower Bridge, its two huge towers rising 200 feet above the River Thames, is one of London’s best-known landmarks. Nothing says “London” more emphatically than this 318-foot tower housing the giant clock and its resounding bell known as Big Ben. It’s as iconic a landmark as Tower Bridge. The tolling of Big Ben is known throughout the world as the time signal of BBC radio. Below it, stretching along the Thames, are the Houses of Parliament, the seat of Britain’s government for many centuries. It was once the site of the royal Westminster Palace occupied by William the Conqueror. Tours of the parliament buildings offer a unique opportunity to see real-time debates and lively political discussions. From Parliament Square, Whitehall is lined by so many government buildings that its name has become synonymous with the British government. Built to mark London’s millennium celebrations in 2000, the London Eye is Europe’s largest observation wheel. Its individual glass capsules offer the most spectacular views of the city as you embark on a circular tour rising 443 feet above the Thames. The journey lasts 30 minutes, often quicker than the time spent lining up for your turn. If you can, reserve your time in advance. The best option is to skip the line completely with a London Eye: Skip-the-Line Ticket. This advance ticket allows you to take a flight at any time on the day you plan to visit. 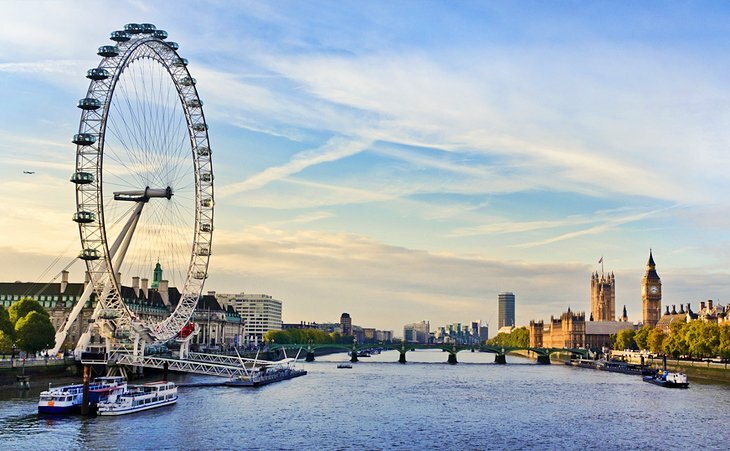 Ready to explore these Must-See Tourist Attractions in London? More pocket-friendly deals are available on Konga Travel Now!